The answer to UNAUTHORIZED COUPON DUPLICATION is two fold. There are a number of Document Security features that may be used to validate a coupon at the time it is redeemed. These features are incorporated in the base stock used to print coupons. Second, and most important, a person needs to validate the coupon. Coupons may contain a static number. Unfortunately a static number and/or bar code and be easily duplicated. Unless the coupon number is unique to each coupon, it provides no security. It is important that SECURE COUPON PAPER contain layer on Layer security. REMEMBER .... securing the sheet is only half of the battle. Someone needs to VALIDATE the coupon at the time it is redeemed. Someone needs to check to confirm the coupon is an original before redeeming. Layer on Layer security means the coupon contains a number of features, many which are virtually impossible to duplicate. 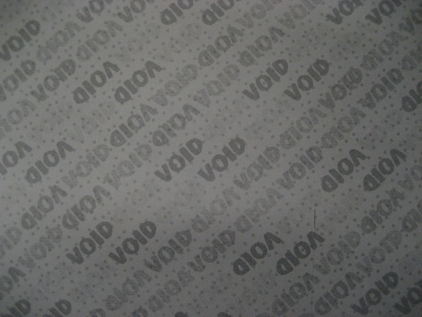 the word "VOID" appears on the photocopy in the background. As technology continues to improve, it is important to note that Hidden Message Technology, the technology used to cause a VOID to appear when a document is photocopied or scanned, does not work 100% of the time on 100 percent of the copiers and scanners. There are a dozen different patents as well as a public domain version used to print this technology. Unfortunately NONE of these methods work 100 percent of the time. duplicate a document printed on SecureGuard REACT papers. Artificial Watermark is printed on the back of each sheet. This watermark will not appear on copy when the document is duplicated. Hold on a 45° angle to light to view watermark to identify original. This web site was prepared by the Document Security Compliance Department at Micro Format, Inc.